The recipes in Mr. Wilkinson's Vegetables range from simple salads such as Brussels Sprout Leaves, Mozzarella, and Anchovies, or Roasted Cucumber, Quinoa, Freekah, and Herbs, to hearty dishes such as Soft Parmesan Polenta with Crab and Mussels, or Braised Eggplant, Tomato, and Meatballs. They also include satisfying snacks like Irene's Tzatziki, or Smoked Tomato and Goat's Curd Gougéres, as well as desserts, such as Carrot Cake with Grated Carrot, Preserved Lemon, Raisin, and Ginger Pickle, or Creamed Rice Pudding. While many of the 80 plus dishes will appeal to vegetarians, there are plenty that incorporate meat. In all of them, Mr. Wilkinson's vegetables are the stars. Matt Wilkinson is passionate about food in season, farmers' markets, and local producers. As the former head chef at the award-winning Circa the Prince, Wilkinson helped usher in an era of organics and gardento- kitchen rustic fine dining. He now co-owns and runs Pope Joan and the neighboring market Hams and Bacon in Melbourne, both of which have cult followings for their fresh, seasonal food. He is also the coowner and chef of a franchise of 11 Spudbar slow-food, fast-food shops in Australia, which feature healthy and delicious topped baked potatoes and salads. 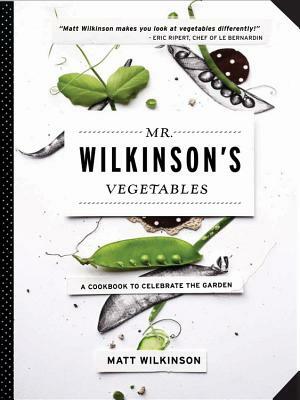 His first cookbook, Mr. Wilkinson's Vegetables, won the IACP cookbook award for design and has sold more than 100,000 copies worldwide in nine languages. He lives in Melbourne, Australia. For current news, visit mrwilkinsons.com.au. "I build my dish around what vegetables are in season because this is when they will be the cheapest, most readily available, and, most importantly, taste the best?and surely this has to be the most important factor when cooking. ? This is where I'm a little different with my veg-first approach." With that, and only that, Matt Wilkinson, author of Mr. Wilkinson's Vegetables, encourages readers to think about a protein to add (meat or seafood), considering how the flavors will marry together with the chosen vegetables. Revelatory! What follows are twenty-four chapters devoted respectively to asparagus, beans & peas, beets, broccoli, brussels sprouts, cabbage, peppers, carrot, cauliflower, corn, cucumber, eggplant, fennel, garlic, horseradish, leaves from the garden, nettle, onion, parsnip, potato, pumpkin and squash, radish, tomato, and zucchini?each accompanied by gardening and preparation know-how and three or more recipes. Mr. Wilkinson's beautifully photographed and illustrated vegetables cookbook is simply a must acquisition for anyone who reads, cooks, and eats.